Nuclear Fusion: How Difficult Is It and Why Is It Taking So Long? The Sun has always been an object of wonder for humans; it has represented deities riding chariots with hawk-heads, monuments have been built to worship it such as Stonehenge and the pyramid of Kulkulkan in Mexico, and its absence during eclipses struck fear around the world. Ancient astronomers studied its motions across the sky, estimated its distance from Earth to within a few percent, and predicted heliocentric models for the solar system centuries before Copernicus, Galileo and other modern scientists moved these heretical ideas into mainstream thought. As well as being wondrous, the Sun is profoundly useful. It provides light, and as 18th century scientists began to discover, is required for photosynthesis and for all life to exist. The quest to understand how the Sun works is also the beginning of the story of nuclear fusion. The easiest fusion reaction to achieve is between deuterium (2D “heavy” hydrogen) and tritium (3T “super-heavy” hydrogen) nuclei to form helium plus an extra energetic neutron. This is demonstrated in the reaction equation shown below and in Figure 1. The small mass loss is turned into 17.6 MeV of energy, 14.1 MeV of which is the kinetic energy of the neutron, the rest goes into kinetic energy of the He ion. To put this energy into context, 1 kg of deuterium and tritium fusion fuel is equivalent to 1 million tons of coal. 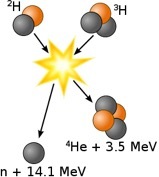 Figure 1: Fusion reaction between deuterium and tritium to form helium and an energetic neutron. Image by Wykis distributed under a CC-BY 2.0 license. Very pessimistic predictions suggest that for the D-T reaction there is 750 years’ worth of fu-sion fuel, with the possibility of extending this by extraction from seawater. With foreseeable technological advances, more difficult fusion reactions between deuterium nuclei alone could become possible and the fuel supply could last beyond the predicted life of the Sun. These reactions do not produce radioactive waste, nor any greenhouse gases or other harmful pollutants. Indeed, helium is a very useful gas which is in short supply because it literally floats away, and the neutron is the means of extracting energy from the fusion reaction. This sounds very simple, and desirable, so why has it not been achieved? Simply, fusion is very difficult to achieve. For the purposes of this essay most of the problems are conveniently condensed into the “Lawson Parameter” proposed in 1955 by John D. Lawson (Lawson, 1955). This consists of the triple product of plasma density (n), confinement time (τ), and temperature (T) as the parameters for achieving viable fusion, where more energy is produced than is put in. The current record of nτT is held by the JT-60 Tokamak in Japan at 1.53 × 1021 m-3 s KeV which is close to the target of nτT ≥ 5 × 1021 m-3 s KeV (Ushigusa, 1997). Improvement of the triple product had been growing faster than Moore’s Law until the late 1990s when it stalled. Nuclear fusion has been achieved; the Joint European Torus (JET) in Oxfordshire, was regularly breaking records between 1991 and 1997 for releasing fusion energy, and will begin again in 2018 after upgrades to the heating systems, first wall, and divertor. But even with significant improvements, the existing machines are no longer big enough to make significant progress. To achieve fusion, the most conventional and successful way is to contain a super-hot plasma in a donut-shaped magnetic field created by a machine called a Tokamak (Figure 2). To improve the triple product towards achieving the Lawson criterion, one can increase the magnetic field strength or make the plasma bigger. The aim is to increase confinement time, τ, which is the length of time plasma particles remain in the plasma before being circulated to the outside and ejected. This gives more chance for fusion reactions to occur by ions colliding, and the longer the particles stay inside, the less heat is lost, so thermal efficiency is improved as well as plasma temperature, T. Other types of fusion using laser implosions to compress the fuel aim to massively increase the density n, which also has the effect of increasing τ and T by making matter so dense that particles struggle to escape and are confined for a longer time. This inertial confinement technique is nowhere near achieving viable fusion and is mainly used for military research and fundamental physics, but is an alternative way to think about solving the triple product challenge. This problem of improving τ was known in the early 1980s when JET was beginning operations, and plans were already in motion to improve it. As the Cold War was beginning to cool, fusion research was heating up. The Soviet Union were world leaders in Tokamak design having invented them, while the West had been pursuing dead ends such as linear magnetic mirrors to hold a plasma, and pinch devices which use a very high current through the plasma to produce Lorentz forces compressing the plasma to high pressures. With the commissioning of JET and other advanced Tokamaks the USSR was falling behind. At the Geneva Superpower Summit in 1985, Reagan and Gorbachev proposed a collaboration between American and Soviet scientists on fusion energy which led to ITER (International Thermonuclear Experimental Reactor). Over 30 years have passed, in which time half the world’s population have become represented in the project. Its membership consists of China, the European Union, Russia, Japan, South Korea and India, and the fluctuating involvement of America. Initial designs for ITER began in 1988 and were finalised in 2001 based on technology available at the time, or which was near availability. Further alterations such as vertical adjustment coils, have been made based on new research from JET and other Tokamaks, but the basic design was set. The result is a machine more complicated than anything else ever created (Figure 3). More unique parts are involved than in the Large Hadron Collider or even the International Space Station. It is a hugely complex, expensive machine which is over-budget and overdue, and has become too big to fail. The machine which was already out of date before being completed. With so many government agencies involved in ITER, politics has had more of an impact than would be desired. The plan was that the components would be built by countries with the most expertise in that technology area, informed by research on existing fusion experiments around the world, then shipped for assembly at the building site in southern France. However, the harmonious ideal of scientific research is in conflict with nationalistic industrial strategy. Some members feared that if one country developed manufacturing expertise in a particular key component, for example by making all the superconducting magnetic coils, when commercial reactors come to be built that country would have an insurmountable head-start in capability that would result in a monopoly on that technology. The result is duplication of efforts plus an extra stage of testing to make sure that both countries are making parts to the same specifications. Bureaucracy associated with many agencies each serving their own self-interests has mostly been overcome with a better management structure, but caused significant hold-ups especially during the early manufacturing procurement stage. This kind of complication has contributed to the lumbering inefficiencies with which ITER has become synonymous. The construction cost is split between the partners (China, the European Union, Russia, Japan, South Korea, India, and America), with Europe footing the largest proportion, as it would receive the biggest benefit from ITER being situated in France. The construction cost estimate at the time of finalising the initial plan was €5 billion. This is now estimated to be €20 billion (Iter organisation, 2017). In 2010, when building work at the Cadarache site was in the early stages and the cost was increasing, the entire project came to a halt when additional EU funding did not initially appear. Combined with US funding coming and going with different administrative policies, ITER finances have fluctuated wildly causing delays and jeopardising the entire project. As a display of scientific collaboration, it is a success. As a project management exercise, it is a failure. That is not to say the experiment will fail. Although much bigger than any other fusion machine, the design is fairly conservative and based on well understood principles developed by thousands of scientists over many decades. Everyone expects it to work, and to demonstrate fusion energy gain by releasing ten times more energy than it uses while providing useful information to design other big machines, if they are ever built. Large engineering projects, especially in the USA and Europe are becoming unfeasible as governments are often unwilling to finance them. This is demonstrated well by Hinckley Point C nuclear fission power plant struggling to get private financing. Only with reassurance of a guaranteed price of electricity from the UK government, and Chinese government investment did it become possible to fund the project. It is unlikely that once the current generation of large nuclear reactor projects are finished, including Moorside and Wylffa, that any other large reactors will be built in the UK. It is also unlikely that any private utility company could afford a large commercial fusion power station the size of ITER, let alone DEMO, (DEMOnstration Power Station) the commercial scale demonstrators which will be built based on learnings from ITER. The industry trend with fission power stations is towards Small Modular Reactors (SMRs) producing less than 300 MWe, with various affordable designs waiting for approval by regulators. These machines are simpler, and with the benefits of mass production and multiplicity could be cheaper and faster to produce. Multiple SMRs being built on one large site, or being deployed individually in remote places with high power demands, such as military bases, mines, or after natural disasters, is likely to be the picture of nuclear power in the future. In 2001, the small fusion reactor was considered impossible, and not necessary: increasing size was the only feasible way to achieve the Lawson criterion, the electricity grid was designed around having few large power stations, and finance had never been an issue before. But now technology is becoming available to shrink the size of fusion power plants. The key lies in high temperature superconductors (HTS) which are able to sustain a higher magnetic field than low temperature superconductors as used in ITER and other existing experiments. Instead of increasing the plasma size as with ITER, the HTS materials allow higher magnetic field strength to target the critical Lawson Parameter. At the time of designing ITER, these HTS materials didn’t exist outside of theory and small lab samples, and it was considered too risky to use them in the design. Of course, there are still challenges to using these materials, specifically joining them, but their theoretical benefits are enticing enough that research into them has been faster than expected. One of the key benefits is the reduction in size of machine which high temperature superconductors would allow. Smaller machines are cheaper; cheap enough that private compa-nies are able to develop them, of which Tokamak Energy, based in Oxfordshire, is one of the leading companies. They promise “a faster way to fusion” making electricity by 2025, and on the grid by 2030 (Tokamak Energy, 2017). This claim should be taken lightly. Scientists have often promised fusion within 20 years and have failed to achieve it in this timeline. What makes Tokamak Energy different to academic research institutes is that their existence as a private company relies on meeting milestones agreed with their investors. The team, originating from Culham Centre for Fusion Energy (CCFE) who run JET, and the Mega Amp Spherical Tokamak (MAST), have expanded rapidly and have built various small devices achieving all of their milestones to date. Through small stepping stones and separating challenges to be solved individually, they hope to take advantage of new technology and be more flexible, rather than aiming for a huge leap as ITER is doing. Now on their third of five targets, fusion relevant ex-periments are beginning to take place. Will Tokamak Energy be making economical fusion electricity, ahead of the mainstream scientific community? The key will be whether the HTS works as expected, and whether it can be manufactured reliably and incorporated into a machine. Criticism of Tokamak Energy has primarily consisted of their reliance on mainstream science to do the expensive hard work of designing new materials and techniques, and developing an industry to build them. This includes appropriate structural materials resistant to radiation damage and the critical HTS materials themselves. This is changing through sponsorship of university-based research to accelerate progress and improve collaborations. Additionally, Tokamak Energy are not able use tritium fuel in their devices since it is radioactive and highly controlled. Until they have a machine in a suitably secure location, such as CCFE, they won’t be able to demon-strate D-T fusion. Although private companies are flexible, and some have access to significant funding, they are short of political muscle when it is needed. Getting hold of tritium and navigating regulatory issues where the regulations don’t yet exist are areas where government labs can exploit their public connections. The relationship between mainstream science and private companies has also been somewhat fraught. They are often founded by ex-mainstream scientists whose ideas have been rejected, leaving under a cloud. Countless times private companies have an-nounced commercial fusion in the next few years with wacky designs which have never been near achieving the necessary conditions. With each announcement, public hopes are raised based on no evidence. Each time questions are asked about whether public money is being well spent on fusion research. Why bother? History shows a continual stream of failures and broken promises; cost overruns and delays. That is partly why ITER has become so conservative in its approach, and is too big to fail. The reputational damage caused by broken promises has made fusion research unpopular compared to other fields of science. As well as Tokamak Energy with its fairly conventional approach, a few other companies have unconventional, but well-funded research programs. Tri-Alpha Energy use a cylindrical plasma configuration with fast colliding plasma fronts heated by ion beams, and are funded by Gold-man Sachs and Microsoft co-founder Paul Allen (Tri-alpha energy, 2016). Peter Thiel, co-founder of PayPal, along with NASA are investing in Helion Energy with a similar device to Tri-Alpha but without the ion beams (Helion Energy, 2017). General Fusion funded by the Ca-nadian and Malaysian government sovereign wealth funds, plus private investors including Jeff Bezos, founder of Amazon, inject plasma into a vortex of liquid lithium-lead alloy, and compress this with shockwaves from powerful mechanical hammers (General Fusion, 2017). The impressive claims emanating from these companies are enticing, but the technology is mostly based on old theories previously rejected by academia, and not supported by published results. If one of these alternative approaches does turn out to work, the mainstream fusion research community would be left embarrassed with difficult questions to answer. This is unlikely to happen. Nothing other than a Tokamak has reached useful fusion-relevant conditions, and the tricks these companies promise to exploit have been repeatedly debunked. The real competition is between large conservative Tokamaks and small advanced HTS Tokamaks. Tokamak Energy’s success is being noticed in the mainstream world. Rather than being disengaged, they are now collaborating with universities. MIT have worked closely with them on HTS develop-ment and have a student-led design class for a compact Tokamak, and leading UK universities are hosting PhD research linked to Tokamak Energy. This private-public hybrid approach is in everyone’s best interests for achieving fusion. The ivory towers of academia are opening up to capitalist profit-driven research in a positive way. Based on current ideas the future of nuclear energy is small affordable reactors. Tokamak Energy are working towards this, and combined with the engineering experience from ITER, and academic research they can achieve this. There is no question there will be hurdles to clear before fusion is available on the grid, but working together will be the best way to clear them with a sight on commercial realisation rather than just a scientific endeavour. F. W. Aston, Isotopes, London: Edward Arnold & Co., 1922. A. S. Eddington, The Internal Constitution of the Stars, Cambridge: Cambridge University Press, 1926. Fusion for Energy, “What is fusion,” 2015. [Online]. Available: http://fusionforenergy.europa.eu/understandingfusion/. [Accessed 23 July 2017]. J. D. Lawson, “Some Criteria for a Useful Thermonuclear Reactor,” AERE, Harwell, 1955. K. Ushigusa, “Steady state operation research in JT-60U,” in Fusion energy 1996. V. 1. Proceedings of the 16. international conference, Montreal, 1997. EuroFusion, “Tokamak Principle,” 20 September 2011. [Online]. Available: https://www.euro-fusion.org/2011/09/tokamak-principle-2/. [Accessed 20 July 2017]. EuroFusion, “The virtual vessel with plasma,” 24 August 2011. [Online]. Available: https://www.euro-fusion.org/2011/08/the-virtual-vessel-5/?view=gallery-11. [Accessed 22 July 2017]. Iter organisation, “Iter Tokamak and plant systems,” 28 April 2016. [Online]. Available: https://www.iter.org/album/Media/7%20-%20Technical. [Accessed 22 July 2017]. Iter organisation, “Do we really know how much ITER will cost,” Iter organisation, 22 07 2017. [Online]. Available: http://www.iter.org/faq#Do_we_really_know_how_much_ITER_will_cost. [Accessed 22 July 2017]. Tokamak Energy, “Company – Our approach,” Tokamak Energy, 2017. [Online]. Available: http://www.tokamakenergy.co.uk/company/our-approach/. [Accessed 22 July 2017]. Tri-alpha energy, “About Tri-alpha energy,” 2016. [Online]. Available: https://trialphaenergy.com/company/. [Accessed 23 July 2017]. Helion Energy, “Our Technology,” 2017. [Online]. Available: http://www.helionenergy.com/?page_id=199. [Accessed 23 July 2017]. General Fusion, “Our technology,” 2017. [Online]. Available: http://generalfusion.com/technology-magnetized-target-fusion/. [Accessed 23 July 2017]. Nuclear Fusion: How Difficult Is It and Why Is It Taking So Long? by Alexander Leide is licensed under a Creative Commons Attribution 4.0 International License.